We all want to keep our employees happy, while enabling them to be productive. As we know, productivity and security are two different topics and they rarely go together. If you started using Azure AD, you should know that is now possible to create policies and rules, so that you can protect your company’s valuable information while in the cloud. A Conditional Access policy is simply a statement about When the policy should apply (called Conditions), and What the action or requirement should be (called Controls). Users/Groups are the users/groups in the directory that the policy applies to. Cloud apps are the services the user accesses that you want to secure. Client app is the software the user is employing to access cloud app. Device platform is the platform the user is signing in from. Location is the IP-address based location the user is signing in from. Sign-in risk is the likelihood that the sign-in is coming from someone other than the user. 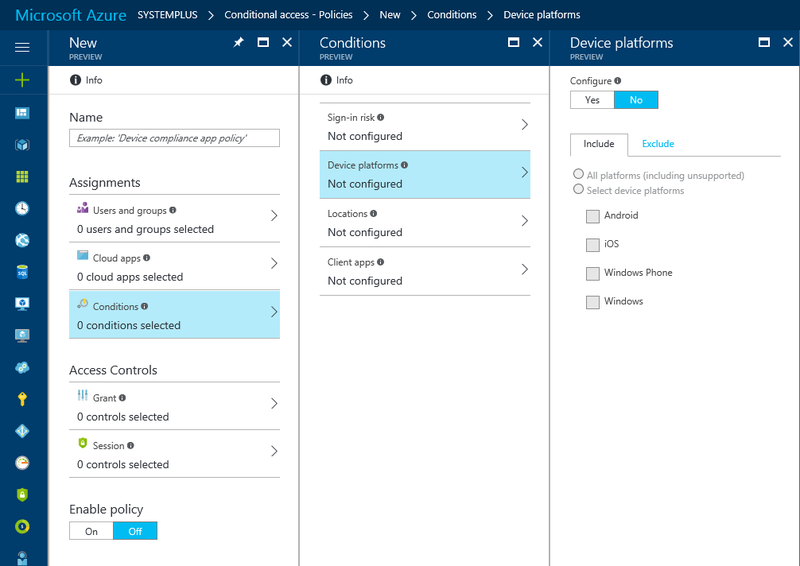 In case that you’re familiar with Intune, you can clearly see that this new admin experience unifies conditional access workloads across Intune and Azure AD. If you are an Intune customer using the existing browser-based console or the Configuration Manager console, or an Azure AD customer using the classic Azure portal, you can now preview the new Conditional Access policy interface in the Azure portal.